"Has anyone talked to Krista lately?" asked Natasha. "I have." Humphrey scowled. "I must say that I do not like where the current manuscript is going." Nina Reid Norwood moaned. "And now she's gathered us all here. Surely you don't think we're being cancelled? I'm supposed to play a big role in the book she's writing now." I looked around at my friends. I had to tell them. 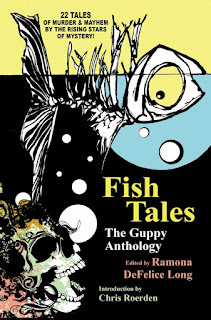 As gently as I could, I murmured, "I hear there's a short story." "A short story? Why don't I know anything about that?" demanded Natasha. She gasped and slapped a hand against her collar bone. "Does that mean she left me out of it?" Mars took a deep breath. "None of us are in it. It's about some woman named Dana." A hush fell over everyone who had crowded into my living room. No one, except Nina, touched the crabmeat dip, the pesto crostinis, or the baked brie I had prepared. Not even the teens, Jen and Vegas. Dash Bennett finally broke the silence. "I hope it's not curtains for you guys. Maggie, Ray, and I aren't regulars, so I figured we'd probably be let go. It's a tough market for mystery characters. I've been thinking of trying my hand at romance." Mars held up a hand. "Back off, Dash. I'm the love interest." I glared at Mars. No one was supposed to know what had happened between us! Wolf raised an eyebrow at me. Humphrey chimed in. "Excuse me. I'm the one who had a crush on Sophie before you ever met her. I'm the love interest." Natasha smacked Mars. "I hope you mean you're the love interest because I'm really the star of the books." The door knocker sounded. Krista arrived with Bernie, both carrying bottles of champagne. She asked me to bring some glasses. When we were all gathered, Krista said, "I'm thrilled to tell you that you were nominated for an Agatha Award!" She handed out the list of nominees. Natasha lurched out of her seat. "Me? I was? Me?" "Not just you." Krista waved her arm. "All of you who were in The Diva Haunts the House!" Krista raised her glass. "I love you all." I wondered if she really loved Natasha, but there was so much good cheer and celebrating that I didn't really care. Mochie sprang around the room in a wild cat dance, Daisy howled, and hugs and kisses were shared by all. And then Natasha had to go and ruin it. Honestly, some people just don't know when to shut up. "What's this I hear about a short story?" she asked, glowering at Krista. "That was nominated for an Agatha Award, too!" said Krista. 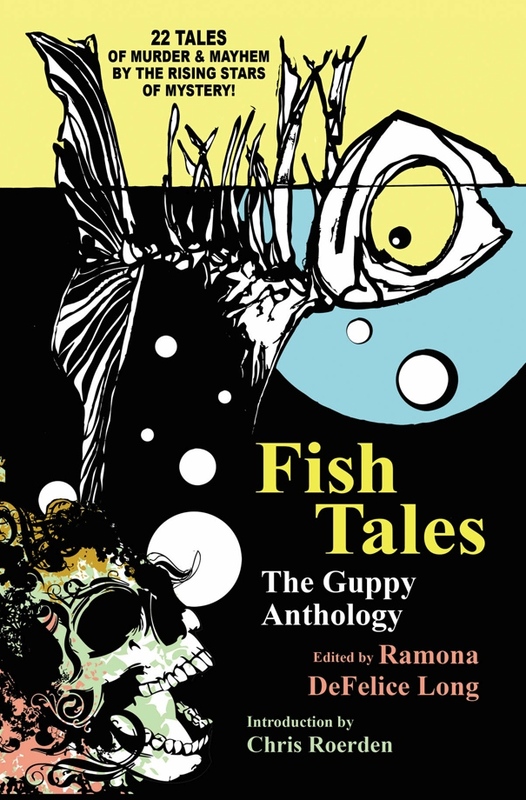 "'Dead Eye Gravy' from Fish Tales: The Guppy Anthology" was nominated in the short story category. I'm twice blessed. I still can't believe it!" The corner of Natasha's mouth twitched. 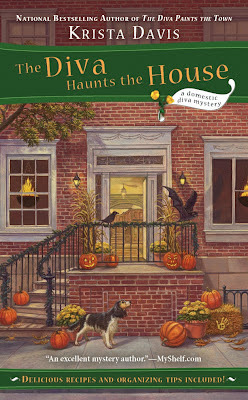 "There was a Dana in The Diva Haunts the House. Oh! There you are." She lowered her voice. "She's not taking over here, is she?" "Goodness, no. You characters worry about the silliest things! It's a different Dana in the short story," explained Krista. Natasha puffed out her chest. "Well, you're very welcome, Krista. I'm sure you recognize that I'm the reason for the nomination." I sputtered. "If anyone is responsible, it's June. She's the one who came up with the story about Viktor Luca." June blushed and shrugged coyly. Krista wrapped an arm around her, and they drifted over to chat with Officer Wong and Leon. Natasha read the list of nominees. "Why does Krista get the credit? My name should be on this. After all, it's the domestic diva mystery series, and I am the domestic diva." I ignored her slight and smiled. We got a nomination! Woohoo! Time to celebrate and thank everyone who nominated us! I lifted my glass. Cheers! And many, many thanks! Congratulations Krista and the gang on your Agatha nominations! such a cute story Krista--big congratulations! Thanks, Lucy! It's amazing what worried the characters behind the scenes. Too cute and your stories are so deserving! Good luck and big congrats. You're too kind, Kari Lee! Thanks so much! Love it! And best of luck at the awards!! Sophie, why are they praised for making our lives difficult? Sophie? I'm the one who questions why Krista makes my life so difficult. If she were nice, she'd tell Mars to marry me already. And why, oh why, does she keep sending animals my way when she knows they shed all over my house? Now, she did arrange for Leon to work for me, so once in a while she does the right thing. Maybe I need to talk with her about Mars. Big congrats on the nomination, Krista!!! Thank you Victoria. I still feel like I might wake up any minute and find it's just a dream. Love this post! I know the characters seem so real that it is hard to believe that they don't exist, but when you write about you meeting with them it is just too great. Love your books and you sooo deserve the nomination! Keep up the good work!! Think I should worry that the characters seem so real to me? LOL! I'm delighted that you like my books, Lynne. Thank you so much. That means a lot to me. How thrilling for you. Best of luck. As I read the post, I was afraid you were going to announce the end of the series. Needless to say, your announcement was so much better. I'll keep my fingers crossed for you and the gang. I feel a teeny bit guilty for saying that I'm glad the gang fooled you. Thanks so much for your good wishes! Krista, congratulations. I'm very excited for you !!! And I'm so glad you took the time to explain to your characters. It is so important to have them in your corner. It's simply horror when they rebel. Uh oh. Surely your characters in the Cheese Shop Mysteries haven't rebelled! Maybe Sylvie? Congratulations on the nominations, that's wonderful news! Perhaps the characters will be able to realize that they are all important to the story? Well written post by a deserving author! Thank you so much, Maureen. Fortunately, some of my characters help keep Natasha, er, other characters in line! Congratulations on the nominations Krista. What wonderful news. Loved the post and hope to read your book soon. I already have on my wish list.